Located between Puerta de Toledo and Embajadores, there is a small, hidden place where I love to go when I feel like going to movies, but not to regular screening movies. Artistic Metropol is not the only independent movie theater in Madrid. But the unique thing about Artistic Metropol is the variety of movies that you can find there daily. The theater started running three years ago, becoming specialized in horror, cult and B-series movies. Even though they still have the best offer in town if you’re looking forward to watching a horror classic back in big screen, they have a huge offer on uncommon movies. They have weekly programs on specific decades, actors, genres, sagas and countries. The thing that I really love about it is the weekly variety of movies and documentaries only released here. In addition to all these screenings, the cinema also works as a window to new filmmakers who just want to have an official release of their projects. Many independent movies have its limited screening here before they get into the commercial circuit. However, the key point about this place is the concept that they try to portray in it. 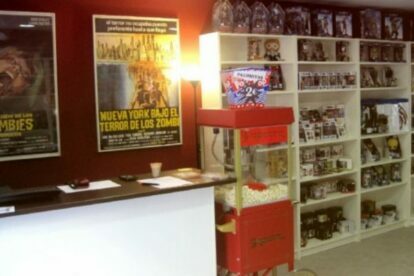 Artistic Metropol is at the same time a theater and a small store where you can find DVD movies, books, limited editions, packs, out-of-stock editions, plus cult/collectors stuff like original posters or toys. The place combines the comfort of being in a familiar small place, with the huge offer of the unknown.